Every pet parent loves to see their dog run in grass. However, there are some wild grasses that dogs should stay away from. 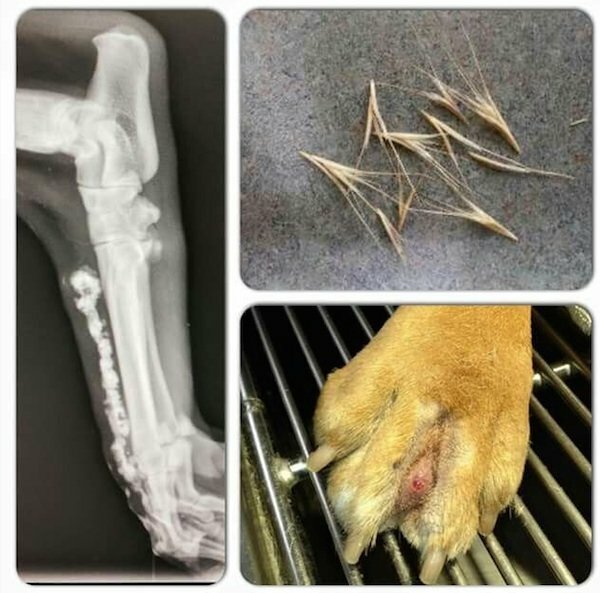 Foxtails are grasses with seed awns that are extremely dangerous to dogs. That’s because the awns on foxtails are barbed, razor-sharp needles, designed to burrow into the ground with the seed. However, they can also burrow through a dog’s skin and enter soft tissue where they can cause serious injury, infection and even death. Xray of foxtail traveling inside muscle of dog’s leg (left); foxtail awns (top right); abscess in paw from foxtail (bottom right). Foxtails torpedo-shaped awns are like bullets and can penetrate any part of a dog’s body. The awns most commonly lodge in a dog’s nose, ears, underbelly, rear end and paws. Long-haired dogs are particularly susceptible, as the barbed foxtail stays attached to the dog’s long fur and are difficult to spot. Foxtails are found most often on wild barley grasses and are distinguished by the hairlike needles that resembles a fox’s tail. Sometimes, they are also called “spear grass”. In some varieties, the spikelets (top) look like common barley or rye grass. The grass most often invades disturbed sites, like a weed. They grow at roadsides, landfills, fence rows, open fields, mountain trails, vacant lots and sometimes lawns. Foxtail grasses can be found throughout the world. Although it is not native to North America, it’s commonly found in the Western and Southern United States, with the greatest foxtail problem occurring in California. Not all foxtails have lethal awns, but grasses such as foxtail barley and foxtail grass have particularly nasty awns. Other kinds of grass, such as Ripgut brome and Canada wild rye, also have potentially dangerous awns. Foxtails can become lodged in between toes, in nostrils or in ear canals. Wherever the foxtail is located, once it’s through the skin of a dog it should be examined by a vet in order to make sure the entire awn is removed. That’s because once a foxtail awn begins traveling through your dog, they do not break down, but will travel through tissue and organs. A foxtail in a dog’s ear can perforate an ear drum. In a paw, it can lacerate the pad and move into the limb. In the nose and mouth, foxtails can eventually migrate towards the lungs. The bacteria carried by an awn can also cause infection and abscesses to form. That’s why removing foxtails almost always requires an anesthetic and surgical procedure by a veterinarian. Dogs may start sneezing vigorously and pawing at the affected area. Sometimes the foxtail is not easily visible (if ingested or inhaled), other times there will be visible wounds. Foxtails are at their most deadly when they become dry and brittle, and the grass heads begin to separate. They cease to be a danger when the spikelets are mechanically abraded (say by farm tractors) or break down in the ground. In some habitats, foxtail can break down in a matter of weeks, but in others it can take months. Copyright © 2018 Norcalkeesclub.org - All Rights Reserved.